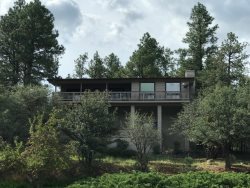 Cool Pines Cabin is located deep in the forest, just 25 minutes south of downtown Prescott at an altitude of 6700 feet. This property is just 7 miles from Lynx Lake, which is well-stocked with fish and hosts a cafe, store, and marina (rent paddle, row, and small electric boats). The cabin sleeps up to 12 guests (2 in the downstairs master, 4 in the upstairs master and up to 6 in a large bedroom). The master bedroom has a queen bed and a full private bathroom with tub/shower. You will find a king bed in the upstairs master, along with a twin bed, and a roll-out trundle underneath. There is also a Smart TV and a full private bath with shower in the upstairs master. An additional hall/powder room is located on the main floor. In a newly constructed addition to this cozy cabin, you will find the convenience of a "mudroom" which allows you to strategically store coats, shoes, boots, and more. It even has a dog wash for those days when a nature hike gets a little too messy for you and/or your furry friend. Directly adjacent to the mudroom is a large "camp-style" bedroom which can accommodate up to 7 people (4 twin beds 3 of which have trundles underneath). In this room you’ll find another large, Smart TV. The living room has a large sectional leather couch, high vaulted ceiling, and is decorated with a welcoming "cottage in the woods" feel. There is a wood burning fireplace for guests to gather around in the cool evenings. A 50" LED TV has HD DIRECTV and is located in the living room. High-speed internet brings a modern convenience for your stay. DVD, CD/radio player and lots of books, games, music CDs and puzzles make relaxing easy in the tall pines location. A fully-equipped, galley kitchen makes meals and snacks a breeze and includes a dishwasher. A washer/dryer adds convenience for longer stays. The Arizona room leads to a brand new, extra-large deck on the south side of the cabin. There are two tables (6-seat & 4-seat tables), plus a picnic table with seating for 6 –ready to be used by friends and family for a delightful outdoor dining experience. A propane grill is provided for outdoor cooking. A house phone can be used for local and US long distance calls, but most cell phones have adequate reception. There is evaporative cooling in the cabin, which keeps it comfortable in the off chance of a heat wave. Natural cooling, by opening windows at night and closing them during the day, lets the wonderful smell of the pines inside. RO (reverse osmosis) water is available in the kitchen and is fine for cooking - but most guests prefer to bring bottled water to drink. There is also a water softener which makes the water more pleasant for bathing. Fire danger is a big concern for local residents. Cool Pines Cabin is a non-smoking cabin inside and out. Although pets are allowed on this property we prefer that you don't bring a lot of animals and that the dogs are on the smaller size. Of course, all pet policies are strictly enforced. Licensed ATV riding is allowed by you must stay on the roads! Enjoy the full Tall Pine Prescott experience in this lovely property!